The United Cycle and Parts Manufacturers Association today warned the Central Government that if it failed to arrest the continuous hike in the prices of steel , most of the small- scale industrial units would shut down. The association, said to be the largest in Asia, has over 1,700 members. Mr DS Chawla president, Cycle and Parts Manufacturers Association and other leaders address a press conference in Ludhiana on Tuesday. Touching scenes were witnessed at Gill village when two sisters of a Kargil martyr tied rakhis on his statue at the village school here today. Raksha Bandhan was celebrated with traditional fervour in the city today. 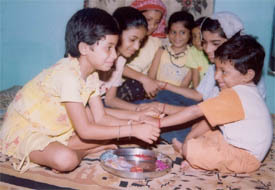 Sisters tied rakhis on their brothers’ wrists and brothers loaded them with gifts and assured them of their protection. They shared sweets with one another. Girls and women were especially dressed up for the occasion. Enthusiasm was seen among small children too. Several schools in the city also celebrated the festival. The elections for the office-bearers of Gurdwara Shri Guru Singh Sabha in Bhai Randhir Singh Nagar took an ugly turn on Sunday evening with the two rival factions charging each other with hooliganism and unconstitutional acts. With the situation getting out of control and supporters of the two groups getting aggressive, the police had to be called in and as many as persons were arrested. The adage , all is fair in love and war, has once again been proved in the forthcoming elections of the British Columbia Veterinary Medical Association (BCVMA). Two Indian veterinary doctors, vying to become the members of the BCVMA, are fighting it out not only on the western turf but right here in the Punjab Agricultural University campus from where they graduated. Former Chief Minister and president of the Shiromani Akali Dal, Mr Parkash Singh Badal, and the SGPC president, Mr Gurcharan Singh Tohra, today inquired about the health of senior Akali leader, Mr Surjan Singh Thekedar. Both the leaders, who came separately, did not meet anyone and made a quiet exit. In an effort to acquaint the children with the significance of modern as well as traditional festivals, many schools are leaving them confused. Like recently, on August 4, all children were told to bring friendship bands and the kids tied these to each other, with a message of friendship. The state government has decided to hold a state-level function to observe the Martyrdom Day of Shaheed Master Karnail Singh Isru who laid down his life during the Goa Liberation Operation in 1955 at his native village Isru on Independence Day. The rural and urban units of the District Congress Committee (DCC) will honour 150 freedom fighters on Independence Day. The DCC units will also organise Kranti Jyoti Yatras on August 13 and 14 to remember the martyrs and other freedom fighters. Activists of the PSEB Employees Federation have condemned the anti-people and anti-employee policies being implemented by the government in Punjab. Mr Surjit Singh Goraya, president of the federation, said the policies had caused a lot of heartburn among the employees who were now living in a state of distress. The Shiromani Akali Dal (Badal) and the Shiromani Youth Akali Dal (SYAD) would continue their fight against witchhunt by the Congress government in Punjab. This was stated by Mr Sharanjit Singh Dhillon, president of the SYAD, while addressing a workers’ meeting at the residence of Mr Sukhwinderpal Singh Garcha, a prominent Youth Akali leader, here today. “Monsoon Hungama” proclaim many posters in the city. They offer discounts up to 50 per cent on electronic equipment, clothes, shoes and even bed linen. Even gold-smiths are offering discounts. It so appears that auspicious time for marriages is coming to an end on July 27 and ‘shubh muhart’ for weddings will come again somewhere in October,” say some pandits. Coming to the rescue of public to save them from being duped by some local dairy farmers, scientists at Punjab Agricultural University have recommended a few measures to check the adulteration of milk with urea, starch and other harmful chemicals at the domestic level. Taking strong note of sustained attacks by the government on the employees and various decisions adversely affecting their interests, the joint action committee of the government employees has decided to intensify their stir. Activists of the Construction Workers Union held a convention to dwell on the decision of the Supreme Court banning strikes by employees besides other problems being faced by workers. The warring factions in the District Bar Association have buried the hatchet and unanimously accepted Mr Harish Rai Dhanda as president of the body. In a formula worked out by the factions, Mr Sandeep Kapoor has been made chairman of a committee assigned with the task to survey, take opinion and suggest concrete proposals for seating of those members who had not applied for the chambers committee. The case of alleged sexual harassment of Ms Sandhya Sharma, senior T.B. Laboratory Supervisor, Civil Hospital, Kharar, by Dr G.S. 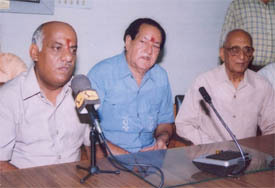 Chahal, state T.B. Officer, took a new turn yesterday when Ms Sharma along with her colleagues met Mr Bir Devinder Singh, local MLA and Deputy Speaker of the Punjab Vidhan Sabha, here today. She gave Mr Bir Devinder Singh a written complaint demanding action against Dr Chahal. 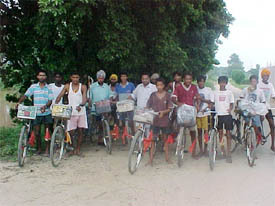 Fifteen youth pedal to Naina Devi Mandir to pay their obeisance during Navratras each year. They belong to lower middle class. On their way back home they said they had been going on the pilgrimage for the past six years. They pray for good health of the near and dear ones. A group of cyclists who pedal their way to Naina Devi temple during Navratras each year. Two persons died and another was seriously injured when a school bus hit a motor cycle on the main road near the sugar mill in Jagraon, about 40 km from here, on Monday. The Division Number 8 police arrested Rajesh Kumar, a resident of Gujjar Mal Road falling under the Kotwali police station , last night from near the dhobi ghat and allegedly recovered 100 gm of charas from his possession. The police said today that the accused was booked under Sections 20,61 and 85 of the NDPS Act. The Apex Chamber of Commerce and Industry today raised 15 questions about the massive hike in the prices of steel and asked the government of India to explain as why it had remained a silent spectator so far. Dr Lal Path Labs Pvt Ltd, Delhi, has opened its sample collection centre at Sant Market here. Ms Taruna Manro, in charge of the centre, said it was the most trustworthy pathology laboratory in India. She said it was the first Indian laboratory to be accredited with the NABL, Ministry of Science and Technology, Government of India, and CAP, prestigious college of American pathologists. Striving towards development of high-yielding varieties of Rabi crop and standardisation of their production and protection technologies, a two-day workshop of agriculture officers began at Pal Auditorium, Punjab Agricultural University, here today. A meeting of the Zonal School Committee was held at Government Senior Secondary School Bhogiwal village, near here, on Monday. The meeting was attended by representatives of around 35 schools. 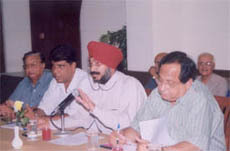 Mr Gurtej Singh Grewal, Principal of the school and general secretary, Zonal Sports Committee, presided over the meeting. The employees of 94 ITIs and 18 polytechnic institutes in Punjab have threatened to launch a stir if the state Cabinet doesn't rescind its decision on privatising these institutes. Dengue that spreads in the monsoon is always an ordeal for the residents of Ludhiana. 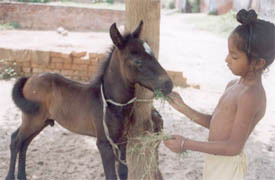 In the year 2001 about 102 patients suffering from dengue were admitted to Dayanand Medical College and Hospital alone. 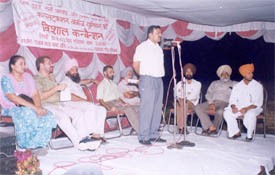 The ongoing agitation of the Punjab Civil Medical Services (PCMS) doctors against the abolition of Non-Practicing Allowance (NPA) by the state government seems to have fizzled out with several doctors saying that they had conveyed their disapproval to the government and now the onus was on the government to decide. 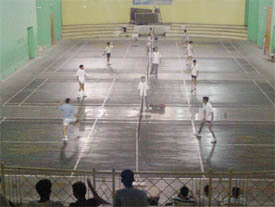 Few shuttlers turned up here today at the Shastri Badminton Hall of the Guru Nanak Sports Complex for the trials conducted by the Ludhiana District Badminton Association (LDBA) to select district teams for the forthcoming Punjab State Badminton Championship slated to be held at Hans Raj Raizada Stadium, Jalandhar, from August 16 to 20.